Max Kohanzad of xLubi.com has started a blog and toned-up his website. Check it out. I have located what is apparently the patent application in question. The inventor is indeed Moshe, but he now apparently lives in New Jersey. It is listed as a "Novelty Item". As one of the anonymous commentators speculated, it is indeed a standard compass with the magnetized needle hidden and another, non-magnetized, needle suspended above it set to point east. At point 14 it points out that similar devices could be made for other locations ". 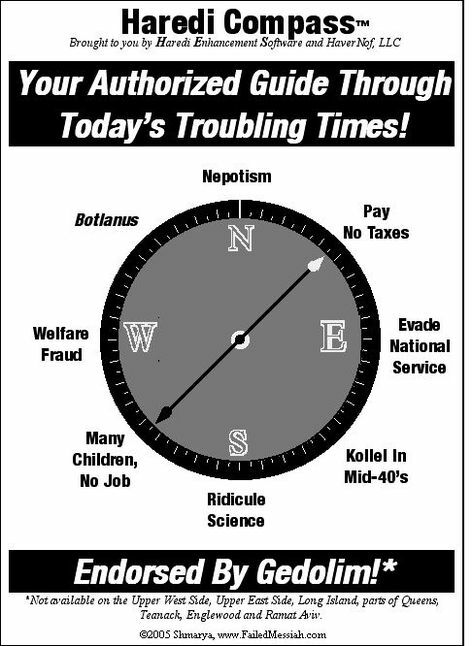 For example, a compass indicating South can be marketed in Finland and Russia," etc. At point 16, it is designed to "appear to defy the laws of physics" by minimizing the space for the magnetized needle. So, it will only work from one location. It does not point any more accurately to Jerusalem than any other compass. It just saves you having to turn 90 degrees. My take on this "invention" can be seen here and here. In what appears to be an attempt to impose Sharia law in the US, a gang made up of members of Lewis Farrakhan's Nation of Islam has allegedly trashed liquor stores, committed arson and kidnapped a store employee. Why? The store Muslim-owned stores sell liquor to blacks. Investigators said it was too soon to say whether the vandals were connected to Monday's fire and kidnapping of clerk at the same store ransacked by a gang of black men in suits and bow ties three days earlier. A ba'al teshuva 'non-denominational' haredi has started two blogs with the sole purpose of bashing the Reform and Conservative movements. Clean your own house, my friend. There is enough dirt there to last many lifetimes. Chabad's front organization the Rabbinical Center of Europe and ZAKA have blocked DNA testing on newly discovered Holocaust remains. The testing would have given closure to surviving family members still seeking information of their lost relatives. This is perhaps the greatest misuse of halakha in our lifetimes. Only truly ignorant men would deprive these families of closure, and these murder victims proper burial in Eretz Israel or in family plots wherever they may be. The bones of 34 Jewish inmates discovered in a mass grave in a military camp in Germany will be reburied in the camp, a spokesman for the Rabbinical Center of Europe (RCE) told Haaretz yesterday. RCE sources said genetic tissue and DNA tests will not be held due to the objection of ultra-Orthodox circles, including the Zaka emergency rescue and recovery organization. It does not appear, therefore, that establishing a blood relationship between the victims and their relatives living in Israel will be possible. Rabbi Aaron Feldman, Rosh Yeshiva of Ner Israel in Baltimore, was an early supporter of the now-banned "Zoo Rabbi" Rabbi Nosson Slifkin. He wrote a disgusting essay distributed several months ago in which he blamed Rabbi Slifkin for the damage done to the reputations of the foolish rabbis (known as gedolim) who banned him. Why? 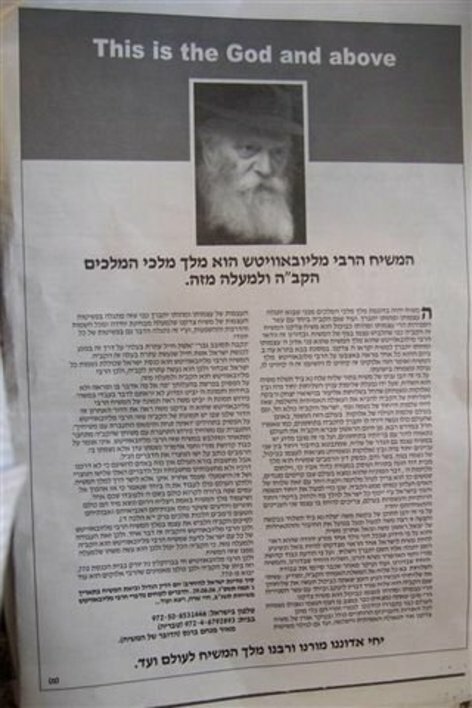 Rabbi Slifkin's defense was to tell the truth, cite his sources and point out the errors of the rabbis who banned him. He did this so well that the gedolim looked bad. Now, Rabbi Feldman has written an untruthful letter (reproduced here) to Moment Magazine criticizing its accurate coverage of the issue. Just another reason why Orthodoxy is no longer a viable or accurate representation of Judaism. Sad. A Jewish historian is claiming that Pope John Paul 2 was Jewish. The "proof" is weak and the argument weaker, but, hey, you never know. Segal wanted to flee from that jail [the haredi world], and to do it quickly. His escape took him on a circuitous route to a Chabad yeshiva in Kiryat Gat, but the sense of imprisonment remained. The prohibition on talking with girls continued, the daily immersions in the mikveh (ritual bath), with its smelly water, disgusted him. He would fall asleep during prayers. But there was also a ray of light: The Chabad custom of trying to persuade secular passersby to put on tefillin (phylacteries). "This was a way to meet secular people and see girls," he explains. The Jerusalem Post's coverage can be read here. Members of the Chabad Hasidic movement will assist Shas in the upcoming elections campaign, the ultra-Orthodox party said Thursday. Shas spokesman Roi Lachmanovitch said that the agreement between Shas and Chabad was reached through MK Amnon Cohen, who is close to billionaire and Chabad member Lev Leviev. Lachmanovitch said Chabad members will help with field work at the Shas election headquarters, and will not be involved in a national campaign as it was in 1996, when it used the pro-Netanyahu slogan, "Bibi is good for the Jews." Leviev's influence in Chabad is mainly limited to those who have a moderate diplomatic worldview. However, other streams of Chabad, spearheaded by the youth, oppose Shas because its spiritual leader Rabbi Ovadia Yosef had ruled that Israel may give back land in return for peace. Chabad officials said Thursday that they believe most Chabad followers will vote for Yisrael Beitenu, headed by Avigdor Lieberman. I wonder if Leviev's escapade with Shas supporter and Sefardi Chief Rabbi Shlomo Amar had anything to do with this unlikely deal being reached. The Chabad Center, in Wayne, N.J., thought the film would make a perfect draw for its Dec. 10 Melava Malka, a dinner celebrating the Sabbath. "You are cordially invited Saturday night to Café Chabad for a private screening of the acclaimed 'Ushpizin' and a Middle Eastern buffet dinner," the invitation read. The admission fee wasn't for the movie but covered the cost of the meal, said Michael, the director of the center, who declined to give his last name. "What's the difference between showing the movie to 25 people in my home or showing it at the synagogue?" he asked. Advised that DVDs contain a strict prohibition against publicly exhibiting the product, he said he hadn't read the fine print. On Tuesday, Chabad arrived at a settlement. The event will go ahead as planned, but Picturehouse will get a percentage of each ticket sold — as in theaters. "I'm not interested in a fight with anybody," Michael said. "I'm the chaplain of the Passaci County prison. You think I want people to visit me there? I'm happy. They're happy. Everything is fine." Lakewood's internet ban has hit the New York Times. But the real news in the piece is that Shtreimel is blogging again. The Rebbe Is "Higher" Than God? Any information on the above poster? A reader sent this in. 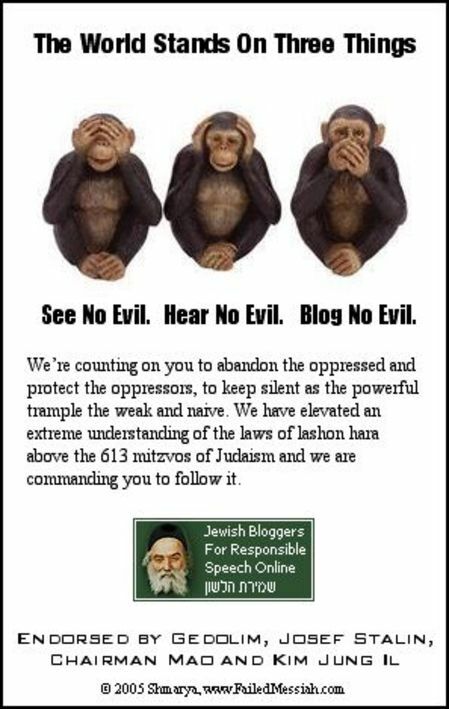 It is supposedly posted around Israel. Readers? The headline reads: "The Messiah the Rebbe of Lubavitch He is the King of Kings, the Holy One, Blessed is He, and higher than this." The close reads: "Long live our Lord, our Teacher, our Rebbe King Messiah forever more." Just when you may have thought the scandals surrounding Orthodox Jewish Republican lobbyist Jack Abramoff couldn't get any stranger, comes this sordid tale of mobsters and murder. Read it at your own peril. Don't be surprised if these scandals eventually bring down the Republican party. Oh, and is all this bad for Jews? You bet it is. Jack Wertheimer's disingenuous article on the declining American Jewish population is now online. Wertheimer, an official of the failing Conservative movement, blasts his more liberal peers in the Reform and Reconstructionist movements for espousing attitudes that reduce rather than increase the Jewish population. But Wertheimer writes nothing about the failings of his own movement in this regard, and does not note that the mass desertion from Conservative Judaism came about because of the movement's own failures. Those formerly Conservative Jews now (occasionally) fill the pews of the Reform congregations whose message Wertheimer so despises. But the real problem with Wertheimer's piece is his whitewash of Orthodoxy. Wertheimer touts the high birthrate – but he is silent on the enormous number of Orthodox Jews on welfare and on the failing Orthodox communal institutions that survive only by raising funds from decidedly non-Orthodox Jews. Further, the average Orthodox family has yearly tuition bills (K-12) in excess of $60,000 per year. Many families take second and third mortgages to pay these bills. Others are forced to homeschool or to hit up relatives – especially non-Orthodox ones – for donations. Wertheimer notes that in less than one generation the majority of affiliated Jews in North America will be Orthodox, and that they will demand (and get) their fair share (figured by population, not donations) of the communal pie. What he does not note is that pie will continue to shrink. As things now stand, sometime toward the end of the first twenty years of Orthodox dominance, the continued hyper-birthrate of the Orthodox will cause a communal meltdown, with need for services far outstripping the financial resources needed to pay for them. Unless Orthodox Jews enter the workforce in large numbers with sufficient training to earn salaries high enough to pay for tuition bills far in excess of the average American household's income, our demographic boom will turn into a spectacular bust. If history is any lesson, the attrition from the Jewish community will be staggering. Poverty does not attract or retain members. Neither does self-serving Jewish leadership of any denomination, whether they sit in Lakewood or JTS. Then we have the increasing phenomenon of attrition from Orthodoxy, from the hallowed streets of Lakewood, Williamsburg, Boro Park and Crown Heights. Dissatisfaction with the communities that Wertheimer extols is clearly on the rise, and, unlike earlier generations where Orthodxy's loss was the Conservative or Reform movement's gain, those who leave seem to leave all organized Jewish practice. Wertheimer seems unaware of this, as well. An honest look at the Jewish community will show that no amount of child marriages and increased social indoctrination will solve our problem. Do you want to stem the attrition from Judaism? There is only one answer, and it is the most difficult solution of all. Fix what is broken – Judaism itself. Darwin: "Moses Can Take Care Of Himself"
Darwin presented the strongest, most detailed argument and evidence for evolution that he could. He also carefully presented the strongest objections to his theory that he could. Under a century and a half of close examination, his theory has grown more and more solid - with refinements, of course. Under the kind of scrutiny that Darwin bestowed on himself, the notion of intelligent design vanishes in a puff of smoke like the bunkum it is. "I do not attack Moses," Darwin once wrote, "and I think Moses can take care of himself." He could, if the fundamentalists and the so-called 'gedolim' would let him. This is the man who in 1917 founded the Cheka, the Extraordinary Commission, which terrorized the nation with the arrests and brutal executions that became known as the Red Terror. This invention was the precursor of the secret police and spy network, the K.G.B., that stood as a symbol of barbarism in the 20th century. Sadly, restoring the Dzerzhinsky statue was not all that shocking. It is one more step backward, like the state's increasing control over the media, like the removal of the president's political enemies by mock trial. Civic organizations are under fire, and President Vladimir Putin is paying unnecessary court to Uzbekistan's despotic and bloody government. Mr. Putin, who has just shuffled his cabinet again, is also said to be narrowing his choice for his successor in the next putative election - setting off a wave of speculation hard to distinguish from the old Kremlinology of who stood where on Lenin's Tomb at the big parades. If Mr. Putin does step down as promised, running against his chosen one could be a very dangerous venture. Stalin's statue was similarly "rehabilitated" ten months ago. While a strong Orthodox community continues to thrive around the Grand St. co-ops and the Bialystoker Synagogue, ancient shuls from Delancey to Houston St. stand like lonely outposts of a bygone era. As younger Jews flock to the blocks their great-grandparents or grandparents might have fled the minute they could afford to, Orthodox rabbis are hoping some of them will be attracted to local services. Chasam Sofer synagogue, the area’s oldest functioning shul, is finally finishing a 30-year renovation process begun by the congregation’s wealthy benefactor, Moses Weiser. It has hosted daily minions (a gathering of 10 men for prayer believed to be a commandment) consistently over the past decades, even through periods when it had to pay people to show up at 7 a.m. The temple no longer has to struggle to muster the required quorum of 10 men, and a consistent showing of 20 to 30 worshipers now attend Shabbat services, said Siff. The Stanton St. Shul, a much smaller tenement synagogue around the corner, is also attracting more attendees, but still struggling to combat decrepit building conditions like a leaky roof. “I’ve seen kids in T-shirts, ski caps and green hair in that place,” said Laurie Tobias Cohen, director of the Lower East Side Conservancy, describing some men who joined recently. Even with some more worshipers, though, the Stanton St. congregation is still pleading for monetary support for repairs. How does this compare to Chabad's efforts in the Lower Manhattan? “We call it a boutique synagogue. You might have to RSVP. There might be a roped line. It will totally be a scene. 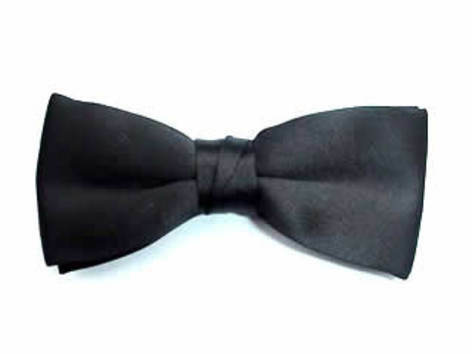 But it’s all kosher,” explained Dovi Scheiner, a thin, 28-year-old [Chabad] Orthodox rabbi dressed casually in black pants and an untucked white button-down, with tallith strings hanging down from his waist. "The examination shows that the signs of cracking and crumbling, which are evidence of structural problems, have increased and become more widespread," the report said. "New cracks were also revealed in the southern wall (of the mosque compound), which shows evidence of movement in the entire wall." 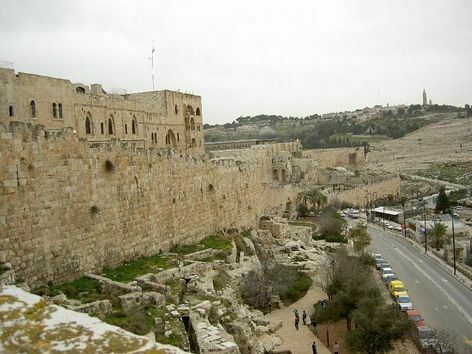 Another 29 sections of the wall, extending a total of 1,280 metres, are also in danger of collapse, but the threat is not quite so imminent, the report said. A 'lost' novel by Vladimir Jabotinsky has just been translated into English. Jabotinsky was in many ways a modern Jewish prophet, who spent the pre-Holocaus years traveling throughout Europe urging Jews to leave while there was still time. He was opposed on religious grounds by the gedolim (Orthodox Jewish rabbinical leaders), who for the most part commanded Jews to remain in Europe. Often thought of as right-wing idealogue, Jabotinsky was far more nuanced a character than that. A passing reference in Ruth Wisse’s “The Modern Jewish Canon” led to the rediscovery and translation of a remarkable novel by Vladimir Jabotinsky. “The Five” — written in 1935 and published a year later in Paris as “Pyatero” — has been reissued in its first-ever English edition, translated from the Russian by Middlebury College professor Michael Katz and published by Cornell University Press. A lawmaker from the ultra-Orthodox Shas party admitted on Thursday in court that he fraudulently obtained his academic degree, under the terms of a plea bargain worked out with the Tel Aviv prosecutor's office. MK Yair Peretz, who received his psychology bachelor's degree through a correspondence course at the U.S.-based Burlington College, admitted that he turned in a paper that he did not write as his thesis. At the end of his hearing, he said that "70 percent of degree-holders in Israel have turned in papers they didn't write." We were only able to be inside with our "body screen TV" (a wearable, portable video player) for a few minutes, but throughout the whole thing (inside with the TV and outside as well), we really reached a lot of people. So many people were shocked at the footage and had no idea how cruel Agriprocessors is and said they wouldn't be buying their products anymore. We also gave out lots of leaflets right around the Agriprocessors' table (and even managed to sneak a few stacks of leaflets onto their tables). Needless to say, they were none too pleased. Security escorted us out as we weren't allowed in with the body screen TV. No surprise there. Anyway, the industry does not want Jews to see the evidence against Rubashkin. It's bad for business. It felt like we had arrived in hell. A powerful stench was discernible half a kilometer away. A little closer, you hear the moans and screams. And inside - overcrowding and filth. Here, several kilometers west of the Galilee village of A'ablin, is where all of Israel's commercial pig farms are concentrated. The inhumane treatment begins at the pregnancy stage. At some farms the sows are kept throughout their pregnancy in small isolation cages that prevent even basic actions such as turning around. Breeding sows are penned up in these cages for most of their lives. The delivery cages are also extremely narrow, supposedly to prevent the sow from crushing her litter. After 23-30 days, piglets are weaned and transferred to a pen. According to attorney Yossi Wolfson, a member of the Health Ministry committee and an animal rights activist, the farms belonging to the association perform the castration by pulling the testicles - without anesthesia or painkillers. A spokesman for the breeders' association said in response: "Great improvement has been made in recent years in the pigs' welfare. In the past, the pigs lay on the ground in their own filth, medical care and hygiene conditions were unsatisfactory. Now the pigs are bred on raised platforms that are washed down daily and kept clean. The feeding system is modern and controled. The pigs are under close veterinary watch. The cages are clean and ventilated in summer, and in the winter they have heaters." While pigs are not kosher animals and rabbis therefore have no say in the pig raising business, it is telling that rabbis have not protested the tzaar baalei hayyim (cruelty to animals) involved in pork production. Rabbis are also silent on tzaar baalei hayyim in the kosher meat packing industry and were the enablers of Rubashkin's notorious throat-ripping shechita. While forcing Jews to observe humrot (extra stringencies) with regard to the kosher status of industrial cooking vessels and other acana, they ignore Biblical commands regarding treatment of living things – and they should be ashamed – but they are not. This is the problem of today's Orthodoxy in a nutshell. 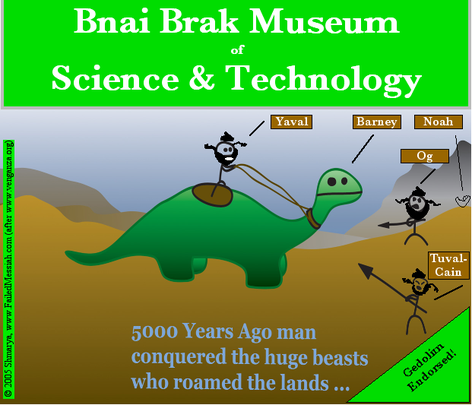 Four of GodolHador's best commenters, Krum As A Bagel, On The Main Line, The 37th Tzaddik and ADDeRabbi have banded together to publish a joint blog, Maven Yavin. GadolHador was the best (and the funniest!) blog on Jewish thought and Judaism's interface with the modern world. While Maven Yavin promises to be a very good blog, we're all still rooting for GodolHador's return. Come on, GH! We miss you! The Humane Methods of Livestock Slaughter Act requires that cattle be "rendered insensible to pain" before they are shackled, hoisted, or cut but recognizes properly performed kosher slaughter as humane. According to the Orthodox Union, kosher law requires that the "trachea and esophagus of the animal are severed with a special razor-sharp, perfectly smooth blade, causing instantaneous death with no pain to the animal." "There’s nothing ‘kosher’ about torturing animals," says PETA campaigner Benjamin Goldsmith. "If you’re buying or eating meat, you’re supporting cruelty to animals -- no matter what assurances you have been given by the government, the meat industry, or religious authorities. What we found at AgriProcessors was the worst of the worst, so we’re urging retailers and consumers to boycott AgriProcessors." It is now 10 months since the USDA investigated AgriProcessors, and the USDA has still not released its report on the investigation. 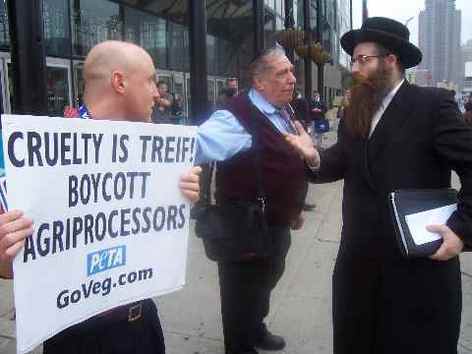 Perhaps the next PETA protest should be held in Washington, D.C.
Should consumers boycott Rubashkin as PETA suggests? Watch the videos linked below and decide for yourself. To view footage of Rubashkin slaughter, click here (5 min. version) or here (much longer version). Selected posts on the AgriProcessors scandal are linked on the left sidebar of this page. All posts, including this one, can be read here (but do so in reverse order, starting from the bottom of the page). Yehudi Menuhin's son has been removed from his father's foundation for espousing "neo-Nazi" views. Lord Menuhin, Lord Isaiah Berlin and the Rebbe were all equal Schneerson cousins. All are direct descendants of the Alter Rebbe. Menuhin's father was, like the 5th and 6th Lubavitcher rebbes, a noted and very public anti-Zionist. A large number of Chabad defenders contend that, because Chabad is "doing so much good" by "inspiring people to do mitzvot and come closer to Judaism," the theological "quirks" of the movement – like its belief in the "second coming" of the "messiah," the late Rebbe who was while alive, is now in "concealment" or in what "only appears to be death," and will be soon revealed to all as, the messiah – can be overlooked. The Rebbe, it is argued, inspired a mass return to the practice of traditional Judaism. Someone who has caused this good cannot be the source of evil. Additionally, the Rebbe is followed by thousands of rabbis. Someone with that type of esteemed following cannot be the cause of sin. Enter Shabbatai Tsvi, Judaism's most infamous false messiah. Shabbatai Tsvi also inspired thousands to repent and return to traditional Judaism. He also had a large number of rabbinic followers. The point I am making is not that Shabbatai Tsvi and the Rebbe are to be equated. The point I am making is this: All the good deeds and the best of intentions in the world do not prove messianship. Only the completion of the specific deeds codified by the Rambam and accepted as halakha (law) can do that. This halakha (law) rules out the messianship of Jesus, Shabbatai Tsvi, and dozens of lesser-known Jewish "messiahs." And it rules out the Rebbe, as well – no matter how many Jews he inspired, and no matter how many good deeds he did. [Redevelopment Authority Executive Director Mike Rosenfeld] said the owner of the properties, Skyline Industries of Brooklyn, N.Y., recently transferred 11 of the 12 parcels to another entity, Southside Redevelopment LLC, also of Brooklyn. Rosenfeld said he doesn't know whether the two entities are connected, but he suspects they are. The 12th parcel, contaminated with industrial chemicals, remains in Skyline's name, Rosenfeld said, and presents a challenge. It needs to be cleaned of its environmental contamination, and the building must be demolished before the land can be sold, Rosenfeld said. The U.S. Environmental Protection Agency sent a Tampa, Fla., contractor to the site to clean up dangerous chemicals and highly flammable powdered aluminium after obtaining a court order allowing it to enter the property. 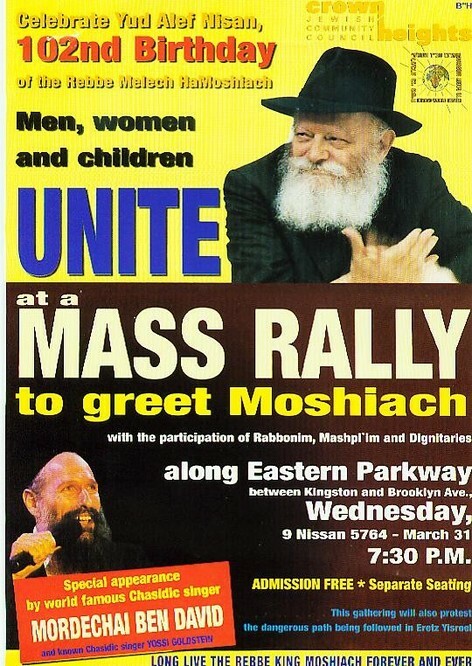 Rabbi Moshe Rubashkin is president of the Chabad-Lubavitch controlled Crown Heights Community Council and a convicted felon. For more on Rabbi Rubashkin and his family, see the links at the side of this page. Thursday's election of millionaire industrialist Vyacheslav Kantor as acting president of the Russian Jewish Congress could pave the way for the return to Moscow of the city's [non-Chabad] chief rabbi, Pinhas Goldschmidt, Jewish sources in the Russian capital said Friday. Goldschmidt was deported from Russia six weeks ago after authorities claimed his visa had expired. Kantor will replace [Chabad supporter] Vladimir Slutsker, who has agreed to assume responsibility for the RJC's foreign and interfaith relations. Russian Jewish sources assessed that Kantor's appointment to the post and the compromise reached with Slutsker have significantly boosted the chances of Goldschmidt's return. Since his deportation, the rabbi has been in Israel, while the governments of the United States, Switzerland (Goldschmidt is a Swiss citizen) and Israel have been working behind the scenes on his behalf. Previous posts on this sad incident can be found here. Chabad has a tremendous new project called the Tefillin Bank, which provides new tefillin to any (male) Jew who wants and needs them. What YU, Modern Orthodoxy and haredim will never understand is how much good will projects like this buy. Because these groups do little (and many do nothing) to help Jews outside their groups, Jews outside of the Orthodox world don't care about them. And not caring about translates into not listening to the advice of the leaders of the Orthodox world. And that translates into a world Judaism dominated by Chabad – including its "second coming" doctrine – probably within the next 20 years. This – and the refusal of the Orthodox world to do anything about it, either to reach out with love, or to fight Chabad's deviant theology – is the greatest indictment of Orthodox leaders like YU's Hershal Schachter and Agudath Israel's Novominsker Rebbe – and of Orthodoxy itself – possible. … At the same time, the Torah stresses compassion for animals. Indeed, the Jewish forefathers are known affectionately as the "Seven Shepherds," and the Talmud describes how God chose Moses for Jewish leadership based on his tender care for flocks of sheep. 9. Shechita (ritual slaughter) must be done with a minimum of pain to the animal. The blade must be meticulously examined to assure the most painless form of death possible. ("Chinuch" 451; "Pri Megadim" - Introduction to Shechita Laws). Rubashkin violated half of these laws. His rabbis, the OU, KAJ and Chabad all approved. Not one rabbi from Aish HaTorah spoke out against Rubashkin's throat-ripping and other abuses. Not one. Remember that well. Do you think basically good, mentally healthy people could murder innocent human beings? The film "Obedience" documents a chilling experiment done at Yale University some years ago by Dr. Stanley Milgram. It paints a sobering picture about human nature. Volunteers are told they're participating in an experiment on how punishment affects one's ability to learn. They are introduced to a man who will attempt to memorize a list of words. In an adjacent room where he can be heard but not seen, this man is strapped to a chair, his arm hooked up to electrical wires. Every time he makes a mistake in memorization, the volunteer is asked to push a button that will give increasingly strong electric shocks. Just before they begin, the man warns the volunteer of his heart condition. The experiment begins. A few mistakes in memorization -- and the volunteer administers some shocks. The volunteer nervously laughs as he hears grunts of pain. The experiment's administrator, a man in a white lab-coat, encourages him to continue with intensifying shocks. As the dosage increases, screams come from the adjacent room, accompanied by desperate pleas to stop the experiment. He cries this is hazardous to his heart. Yet this volunteer -- and the majority of other volunteers -- continue to give electric shocks to the point where they believe they've severely harmed the man. In many cases the volunteers continue to give deadly shocks even after the screams fall silent. When the laboratory administrator instructs the volunteers to continue giving shocks, they submit to the authority figure rather than defy him. The experiment demonstrates that you don't have to be sadistic or deranged follow irrational or corrupt leaders. You can be completely normal and just not be independent enough to question the morality of what you are doing. 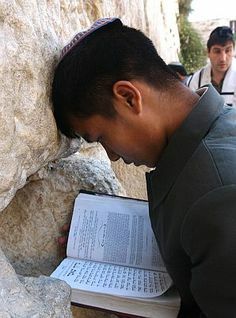 Why, you can even be a haredi, just like me! No one is born and raised in a vacuum. Why should a 17-year-old haredi youth be criticized for blindly following our gedolim? After all, he has been socially conditioned right from the start to act like a sheep. He has never been exposed to any other belief system. All his friends are sheep! Yet the world does criticize us haredim for this. But why? If everyone is affected by social conditioning, how can anyone be morally responsible for his or her actions? Abraham, the father of the Jewish people, confronted these issues head-on. A young Abraham examined the physical world and, relying on his best scientific judgement, reasoned there must be a single Creator of the universe, rejecting his upbringing. He discovered monotheism for himself and embarked on his mission to educate mankind, risking his life in the process. God's initial command to Abraham is riddled with difficulties. Obviously one cannot leave his land without leaving his father's house and birthplace. Let the text simply say, "Leave your land and go to the land which I will show you." Furthermore, one first leaves his father house, then his birthplace and then his country. Why list these in reverse order? The Torah's primary message here is not Abraham's physical departure from his country. Otherwise it would have sufficed to say, "Leave your country." Abraham's challenge was to make a spiritual departure, to leave behind the influences, practices, and emotional support of his family and society in order to become truly independent. These three boundaries (country, birthplace, and father's house) represent three different spheres of influence upon each individual, in ascending order of intensity. Abraham is first commanded to leave his country -- to break away from the idolatrous influence of his land. Then his birthplace -- to abandon the customs and mores that are instinctive. Finally, he is challenged to shake loose from the most intense bond of all -- his father's house -- his primal source of identity and self-esteem. Surmounting this challenge is Abraham's first step in the development of spiritual independence. This is the meaning of the Hebrew term lech lecha -- to go to yourself. God is telling Abraham to strip away the outside influences in order to emerge as a true individual. Of course, both God and Abraham were wrong. This fierce independence labels Abraham the first Hebrew, a term derived from the word "side." Abraham stood alone on the other side. The key to independence? Break out of the confines of society and re-examine the foundations of your convictions. This is the primary challenge for anyone on the road to becoming a true thinking individual. Because without verifying the validity of ingrained values, one can never know if his positions are correct. If we follow Abraham's incorrect example, we haredim who follow gedolim like sheep are responsible for our actions, despite our social conditioning. But, instead of recognizing the necessity to question our society, we chose to remain passive. God's first command to Abraham, and to every human being, is to become independent. So it may appear as if we need to develop the intellectual and moral courage to live by what is true. Without it, it would seem, we are nothing more than a submissive product of society. But, again, Abraham was wrong. Author Biography: Rabbi Nechemia Foofersmith is the co-editor of Raishut.com and director of Research and Development for Raishut In The Name Of Torah in Jerusalem. He is the author of Follow Like Sheep: The Purpose Of Jewish Existence and Sheeple: An Autobiography. He lives in Jerusalem with his ewe and his small flock of lambs. Does the haredi system protect the weak? Or does it curry favor with the strong and abusive? Here's more evidence. You decide. John Milton, the English poet, wrote Areopagitica in 1644 to defend the free, unliscensed press – i.e., blogs – of his day. In honor of Godol Hador, here it is in a free (36 page) pdf download. The Jerusalem Post is reporting Bnei Menashe aliyah has been halted due to pressure from the Indian government. Supposedly, the Indians object to the conversions of the Bnei Menashe – deemed by Sephardic and National Religious rabbis as being from the lost biblical tribe of Menashe – done just before departure to Israel. This conversion process was implemented because Israel's Foreign Ministry refused to facilitate Bnei Menashe aliyah. Conversion makes the Bnei Menashe eligible for aliyah under Israel's Law of Return, circumventing the Foreign Ministry. So, is this another case of the Foreign Ministry overreaching and making its own law? I do not know. But I do know the Foreign Ministry did everything in it power to stop Ethiopian aliyah, until pressure from the US in late 1984 made that stand (almost) impossible. And it did so again with the Falashmura. If software engineers and scientist with MIT degrees were suddenly found to be descendants of the lost tribe of Menashe, do I think the Foreign Ministry would be delaying their aliyah? No way. And that is the point. GodolHador closes his blog. He will be sorely missed. Gil Student continues to descend further into haredi madness. 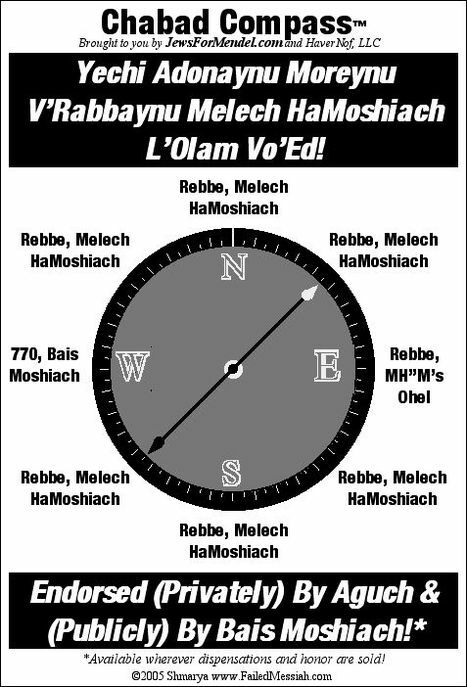 For those tracking the NYU Rebbe conference (post 1, post 2, post 3 – same graphic for each post) you may want to keep in mind that the first rabbi to tout Gosse's 1857 theory of a world created old, with fossils implanted in the earth, etc., was Menachem Mendel Schneerson. As Rabbi Aryeh Kaplan noted, there is no classical Jewish source to support Gosse's theory and, worse yet, it makes God a liar. If you've had problems leaving comments, I apologize. TypePad was down again today. I found this site calling for a class action lawsuit against TypePad. I'm not sure what to make of it, but my anger is rising. In a followup to this post, Ha'aretz reports on Ethiopia's reaction to Ethiopian Jews' protests over the desecration of Jewish graves in Ethiopia. This is the best brief treatment of why Genesis is mythology. It should be mandatory reading for all Jews, especially all 'gedolim.' Say, maybe the kanaim could translate a some of this for them!